In the previous article on Cause & Effect and Product Risk we looked at the first problem – risks are hidden in our roadmap / backlog / plan. We also looked at how to address this problem – leveraging impact mapping and hypothesis formulation to expose those risks. In this article we will take the next steps on our journey to harnessing feedback to address those risks. A lot of writing about feedback from users just says “get feedback” and well, that’s not bad advice but it is incomplete advice. The advice to just “get feedback” is not enough because of the cognitive bias motivated reasoning. We are wired to look for data to reinforce what we already believe, instead of looking for truth. How we get feedback matters almost as much as deciding to get it. We have to define what we’re looking to see, before we start looking. This decision impacts how we write our hypotheses. In Lean UX, Jeff Gothelf references a couple of first-principles of hypothesis writing, including identifying two key elements of any good hypothesis. The first key element is making your assumption explicit: we believe if X, then Y. 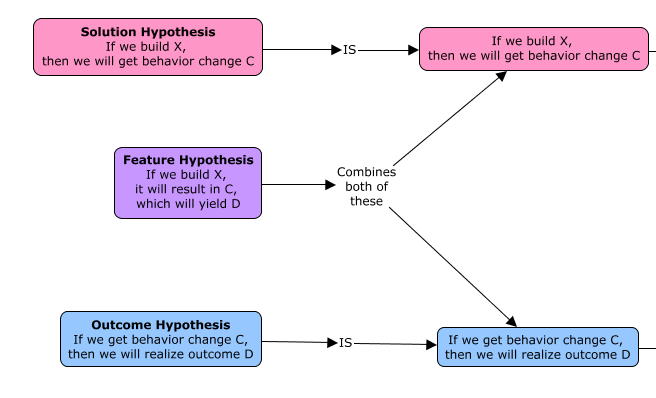 As this decomposition shows, the feature hypothesis is a combination of both the solution hypothesis and the outcome hypothesis into a single compound statement. 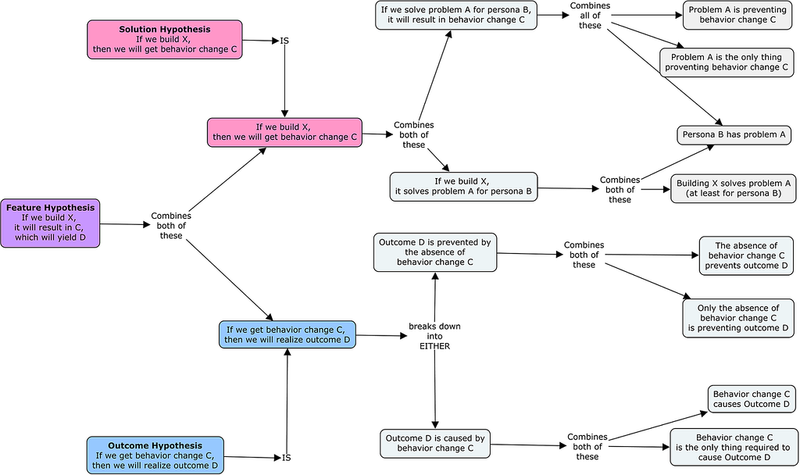 It is helpful to build out a hypothesis tree and identify all of the constituent components of the total hypothesis. I believe the combined form, the feature hypothesis, may be best for organizations who have been executing lean processes for defining, deconstructing and validating hypotheses into their workflow for some time. These teams will not lose sight of the multiple distinct assumptions and may benefit from managing a single hypotheses as the aggregation of assumptions. I often work with teams which have not been explicitly managing the risk in their plans. They are learning how to engage stakeholders to acknowledge that plans even have manageable risks in them. In these environments, I’m usually helping teams escape “feature factory” dynamics where stakeholders are just asking them to build stuff. These teams are focusing on changing the nature of their conversations to be oriented around outcomes, not outputs. There is a benefit from working with two distinct hypotheses types – solution hypotheses and outcome hypotheses. It simplifies decision making while gradually changing the nature of collaboration with other people throughout the organization. The second key element is to identify what you’re looking for to prove or disprove your hypothesis. Forming hypotheses exposes the latent risk in our plans – which highlights opportunities for research, and which informs our investment decisions. When we decide to reduce the risk in our plan (through research) we have to define what we need to see to know if our assumption was valid. We need to make our hypotheses testable. A couple years ago, Roger Cauvin introduced me to Karl Popper and falsificationism. Noun. falsificationism (uncountable) (epistemology) A scientific philosophy based on the requirement that hypotheses must be falsifiable in order to be scientific; if a claim is not able to be refuted it is not a scientific claim. This explicit call-out “we will know we are right when…” is what we write to make the hypothesis testable. As Roger points out in his article, if we don’t write this in a way which is falsifiable, we aren’t writing it in a way which makes the hypothesis provable. We would only be creating the risk-management equivalent of vanity metrics. Our research would make us feel good without actually improving our plan. In addition to making our hypothesis testable, documenting what we need to see before we try to see it is the antidote for motivated reasoning poison. Like a lamp-post to a drunk, we are inclined to use data more for support than for illumination. In Thinking in Bets, Annie Duke unpacks a powerful interpretation of the cognitive psychology research. In a nutshell, we want to feel good about ourselves and about our previous decisions. We feel bad when we find out we’re wrong, and naturally we want to avoid this feeling. So we look for information to “prove” we were right all along. We are, in fact, motivated to interpret the data we acquire as feedback proving our correctness. Hence, motivated reasoning. What we need is an impartial third party to objectively evaluate our results and determine if they prove or disprove our hypothesis. We cannot rely on ourselves to do it. Annie Duke introduces a delightfully clever mental-model for avoiding motivated reasoning, and we can use it to super-charge our hypotheses. She suggests we treat “present self” and “future self” as two different people. Future self is subject to motivated reasoning, and therefore cannot be trusted to evaluate the results of testing a hypothesis. Gathering feedback, when done well, is done in service of testing a hypothesis. Future self is the only person who can gather the feedback. What we do is remove future self’s ability to interpret the feedback. Present-self will predetermine how any information will be interpreted. This is where the third statement in our hypothesis structure becomes very powerful. “When we see Y” is the interpretation. We turn future-self into an objective assessor of truth. Did we see Y? No? Hypothesis disproved. Yes? Hypothesis proved. So, the onus is on us to properly define Y, to make sure the hypothesis is falsifiable. Essentially, to ask the right question. So far, we have taken a couple steps in the journey to improve our product plans. We’ve done it in an iterative and incremental way. First – document cause and effect relationships. This is directly valuable, enabling us to abandon the feature-factory. Second – acknowledge the implicit risks in our plans and formalize hypotheses. This is also directly valuable, enabling us to address those risks. Next – we will look at what we need to do to improve our ability to address the risks.